It is my hope that LMS families will continuously see evidence of these values and beliefs through my words and actions and through the experiences that your student has during his/her time with us. I look forward to serving and working in partnership with you. Let the countdown begin. See you on Thursday! This is a reminder that the LMS Meet The Teacher Night (MTN) will occur on Wednesday, August 30, from 6:30 to 8:30 pm. MTN is an opportunity for parents to follow their child’s schedule, meet their teachers, and learn about course information and expectations. Your child will be given a highlighted copy of his/her schedule to bring home to help parents attend the right class at the right time. Please bring this schedule with you to follow that evening. We will begin the evening with a brief opening meeting in our Gym. Parents will then be dismissed by grade level to locate their first class. Time in each class will be 7 minutes. This short period of time does not allow for extended “Parent Conference” conversations. Should you need to meet with a specific teacher or teachers, please call, email, or schedule an alternative time to meet. With so many people attending MTN, parking is an issue. As a result, we will be providing a shuttle bus that will travel between LMS and Ladue Chapel from 6 to 9 pm. The address of Ladue Chapel is 9450 Clayton Road (just to the east of our campus). Please use the western portion of their lot. Please also be aware that parking in the bank lot across Conway Road is not permitted. A copy of the MTN schedule is available here for your reference. Thank you for your time and we look forward to seeing everyone soon! The district has adopted the Olweus bullying-prevention program this year, and class meetings will be the forum for lessons specifically designed to make LMS a safe and bully-free community. The first class meeting will be held on Friday, August 18. One of our very own LMS alumna started a club several years ago called Kids Knitting It Forward. This group teaches kids and teens how to knit and members knit items including baby blankets, hats, and scarves for local charities such as Newborns in Need of Eastern Missouri and HavenHouse St. Louis. Students fourth grade and older of any skill level are welcome. Time spent attending meetings and knitting items can be counted towards community service hours. More information can be obtained by emailing kidsknittingitforward@gmail.com and meeting dates/times are listed at http://kidsknittingitforward.blogspot.com/. This will also be offered as an LMS After School Activity on Tuesdays from 3:15 to 4:15 pm during Quarter 2 this school year. Please take a minute to review the building expectations and procedures that are listed below. It is my hope that by periodically sharing a few expectations in my Family Update, families will become aware and can work in partnership with us to establish an optimal learning environment and ensure the safety and well being of students while at school. For safety reasons, when students arrive to school at 7:30 in the morning, we ask that they enter the building at 7:30 and remain in the lobby until dismissed to their grade level assigned area at 7:50 (Cafe-6th, Boys' side of the gym-7th, girls' side of the gym-8th). Students should NOT go to their lockers or other areas of the building unless prearranged with a staff member. While in their assigned grade level area, students should sit and remain seated until the supervisor dismisses them to class. Did you know that there is a method to the madness for how we dismiss students at the end of the day? Please take a minute to review the Afternoon Dismissal Procedures that we will be sharing with students. It is extremely important that all students follow these procedures. Doing so allows us to get everyone (bus riders, carpool, and walkers) home safely and in a timely manner. We are fortunate to serve breakfast in the mornings for LMS students. Students wanting to purchase breakfast should report to the cafeteria immediately upon arrival to school (do not go to lockers or class first). If arriving before 8:02, regular breakfast will be provided. Students arriving after 8:02, will be served “grab and go” items. Breakfast is not considered “social time.” Students participating in the breakfast program are expected to eat as quickly as possible and head to class. Please remind your student that electronics, including cell phones, headphones/earbuds, speakers, etc. should remain out of sight for the duration of the school day from 8:10-3:10. This includes lunch. If these items are seen, they will be confiscated as noted in our LMS Student Handbook. We strongly encourage families not to send personal technology devices to school unless requested by the classroom teacher for educational purposes. Note: If there is an urgent message that your child needs to have, please contact the office and we will get the message delivered as soon as possible. Thank you for your help with this matter. As many of you already know, a total solar eclipse will occur on the third day of school (Monday, Aug 21). The partial eclipse will begin at 11:49 a.m. and totality will occur at 1:17 p.m. Thanks to our science department and the Ladue Education Foundation, LMS students will be able to join in this historic event. Viewing glasses have been ordered for everyone in the building and we are planning to dismiss the entire school to fields and blacktop for viewing. Science teachers will be teaching lessons on the first and/or second day of school to prepare the students to view the eclipse safely. Be sure to read the flyer in district Back to School Packets for more specific information. The 2017-18 school year will begin for students on Thursday, Aug. 17. The beginning of every school year brings with it a great deal of information families need to make sure students get off to a great start. During the week of August 1, an information packet was mailed to all district households that contains items for which each family needs only one copy. This is in addition to important information you will receive from LMS. This packet included: bus information (routes will be available on the district website after Aug. 1); food service (including the free and reduced lunch application), the district’s mobile app, Peachjar electronic flyers, the district calendar, the Ladue Education Foundation and the Solar Eclipse. Please watch for it in your mailbox! For safety reasons, students should not be dropped off prior to 7:30 a.m. We do not have any adult supervision prior to 7:30 and our building is locked. Students who arrive prior to this time will have to remain outside. Parents/guardians of students consistently on campus in the mornings without supervision will be contacted by administration. At the end of the school day (3:10), students should either ride the bus home, walk, get picked up, or participate in the TAS (Teens After School) Program. On Monday, Wednesday, and Friday, after school supervision is unavailable after 3:30 unless special arrangements have been made with a staff member to supervise in their classroom. On Tuesdays and Thursdays, after school activities are provided from 3:10-4:10. Students who stay after for activities should be picked up at 4:10, no later than 4:30. As in the morning, parents/guardians of students consistently on campus in the afternoons without supervision will be contacted by administration and may also be taken to TAS and charged a fee. In previous years, we have been able to be a little more flexible with this. Unfortunately, we are unable to do so this year due to staffing. PLEASE MAKE NOTE OF THIS CHANGE as we would want to avoid having students sitting outside in extreme hot and cold weather conditions. All sixth grade students will be involved in an orientation with their grade level principal, counselor, and team teachers on the first day of school. “New to Ladue” seventh and eighth grade students will also participate in an orientation, scheduled on Wednesday, August 16 (8:30 a.m.-10:00 a.m.) This orientation is facilitated by the grade level counselors and is only for students that have transferred into Ladue School District. The following is a reminder to some, and new information for others, regarding our morning and afternoon traffic patterns and drop off/pick up procedures. Our school day for 2017-2018 will be 8:10 am to 3:10 pm. Please be aware that students cannot enter our building until 7:30 am when someone on duty to monitor the front doors and lobby. Students may be dropped off at the front of the building prior to bus arrival (they typically begin appearing around 7:45 am). Please follow the designated traffic flow arrows as you enter our campus from either Conway or Clayton roads. There will be staff members at locations 1, 2 and 3 to help with traffic flow and supervision. Please follow their directions. After buses begin arriving, car traffic will be routed to the rear of the building. The person at location 2 will notify drivers. Please proceed down the right-hand drive all the way to the Maintenance Building (end of fencing), then circle back to the rear of the building through the parking lot, staying to the right. Students will be dropped off at the designed area (ONLY along the sidewalk) and enter the building through the east back door to the Gym. Cars will then exit the campus using the lower drive (two-way traffic) onto Clayton Road. Please, please, (and please) turn right onto Clayton Road. A left-hand turn onto Clayton, at this time of morning, is potentially dangerous and causes a backup for cars attempting to exit our campus. Please be aware that buses begin lining up in our front Circle Drive around 2:45 pm. Cars parked in the Circle Drive have the very good chance of getting blocked in as more buses arrive. If you have the need to pick up your child before dismissal, I would highly suggest parking in one of the marked parking spaces in the lower drive. 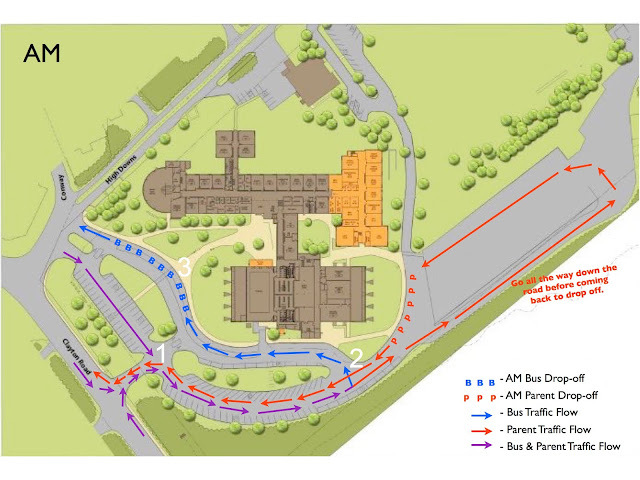 Cars will be directed to the back of our building to form a “carpool line” as indicated in the second photo. NOTICE: This year the carpool line will begin lining up backwards to previous years. Please drive all the way down the right drive to the Maintenance Building. If there are students on the parking lot (fenced in area), please wait at the gated entrance until students leave. Then, pull into the lot on the LEFT side and begin a line at the recycling bins (along the fence INSIDE the parking lot). When the line reaches the gate at the back, begin a new line just to the right of the existing line. This should keep the lower drive from backing up and blocking cars wanting to leave. A staff person will be located at area A to assist with this. At dismissal, students who rides buses will be dismissed first, while students who are picked up by car and those that walk will be held in the lobby (until about 3:20 pm). Please do not instruct your child to leave the lobby with bus riders and walk through our lots to meet you at your car. This is potentially dangerous as students do not always watch for traffic. It also puts the child in an awkward position as he/she is not following school rules and can be assigned a consequence for not doing so. If you need to pick your child up before buses leave, please notify your student’s grade level administrator and meet your child at the front of the building so that he/she is accompanied while walking through our parking lot. Students are NOT to exit through the doors near the Gym or in the 6th and 8th grade halls. Buses are typically loaded within 10 minutes of the 3:10 pm dismissal. Once buses are released, then the staff member at location A will signal cars to approach the front of the building. Students waiting in the lobby will then be released to be picked up by car. Most students are gone by 3:30 pm. Please make sure your student knows his/her assigned bus number. Bus riders will have a maximum of 10 minutes after the 3:10 pm dismissal to gather their belongings and exit the front of the building. Students must check the “bus board” located near the Circle Drive at the end of the sidewalk leading from the Main Lobby doors to determine the location of their assigned bus. Students should board the bus quickly, rather than loiter in the front of the building. A temporary bus pass may be used for a student to ride home on a different bus. Passes are available on the district website and the Welcome Center and must be completed and approved BEFORE the date of use. Drivers should be given a copy of the completed and approved bus pass as the student boards the bus. Thanks for your patience with all of this. It is much easier to verbalize than to communicate in writing. Everyone typically gets the hang of this within the first fews days of school. Our goal is to get students delivered and picked up safely, while also trying to keep traffic flow moving. When school is in session a number of cars have been cutting through Picardy Lane (northeast corner of Conway/Warson) causing traffic to back up at this intersection. We are asking families for assistance as a courtesy to the residents in this neighborhood. Please do not use Picardy Lane as a cut through to get to the school in the mornings. We have been advised that there will be police presence in that neighborhood to deter those who use it as a means of avoiding the intersection at Warson and Conway Roads. Our building policy does not allow consumption of food by others for safety reasons and to promote healthy living. Chartwells Food Service is offering treats for purchase to families that want to do something special for a birthday or other milestone. We appreciate Chartwells for providing alternative options to families that want to have celebrations at school during lunch shifts. Check out the flyer that is attached to this update. Seventh grade families, please remember to pick up a flyer about the 7th Grade Trip to Memphis at Packet Pick Up on August 7. The dates for the trip are March 8-9 and the cost per family is $200.00. More information will be shared later. Please note that we are prohibited from allowing any 8th grade student from beginning classes until the necessary immunization information is provided. Eighth graders have the opportunity to play sports with other local middle schools this year in a play, no cut, free program. The sports offered are: volleyball (girls) and cross country (co-ed) in the fall; basketball (boys and girls) in the winter; and field hockey (girls) and track (co-ed) in the spring. All students who would like to participate must turn in a physical that is dated on or after February 1, 2017. Fall sports start a few weeks after school begins, so please schedule your child's physical if he or she needs one and would like to participate. More information about sign-ups will come out when school begins. The Ring-A-Ram is the student/parent phone directory (also known as the buzz book) created and published by the LMSPA. If your contact information has changed since the last school year, please let us know! Ring-A-Ram directory entries will be included only if we have your contact information. Please email Marianna Tripp chayka@sbcglobal.net with any updates or changes. Join fellow parents as we celebrate another school year starting at the annual LMSPA Parent Coffee on Friday, August 18 from 8:30 a.m. to 9:30 a.m. in the Ladue Middle School Cafeteria. Enjoy refreshments, meet other parents, ask questions and talk with the LMS principals and counselors! Hosted by The LMSPA Executive Board. We hope to see you there! Wed. September 27, 2017 from 7-8 p.m.
Tues. October 17, 2017 from 12:30-1:30 p.m.
Wed. November 15, 2017 from 7-8 p.m.
Tues. December 12, 2017 from 12:30-1:30 p.m.
Wed. January 10, 2018 from 7-8 p.m.
Tues. February 13, 2018 from 12:30-1:30 p.m.
Tues. March 13, 2018 from 12:30-1:30 p.m.
Wed. April 11, 2018 from 7-8 p.m.
Tues. May 8, 2018 from 12-2 p.m.
That’s all for now. Looking forward to seeing everyone soon. Greetings from your building principal Dr. T-J! I am so excited to start my second year at LMS as principal and to welcome everyone, especially our new sixth grade class to our wonderful school. I really missed seeing everyone over the summer. Don't get me wrong. The break was needed and appreciated, but it feels good getting back into my normal routine. I truly enjoy being around students and having an opportunity to interact with the school community as a whole each and every day. I am pumped and excited to be back at work with my team of administrators and support staff. We have been meeting regularly to prepare for your arrival. I am anxiously awaiting the return of our dynamic teaching staff as well. If I were to guess, most of them did something school related over the summer in addition to enjoying vacation with their families. We have such a dedicated staff. send them back to us (smile). Let the good times roll! See you soon. From what I've heard, sixth grade camp went well! Thank you Mark Biernbaum, Scott Lackey, LMS and District Staff, and LHWHS student counselors. I went down for a quick visit on Wednesday to see students from session one complete their final team building activities and to welcome students from session two while they arrived and participated in get to know you activities with their camp counselors. I am always amazed by all that happens over the course of three days. Each and every minute is planned with something fun and the days are extremely organized. I took several photos which were shared with Mr. Alimayu who will be sharing with 6th grade families through Parent Link.